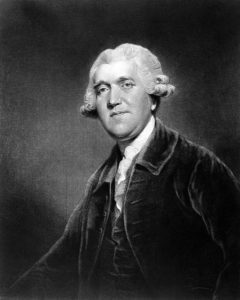 The History of Wedgwood begins with Josiah Wedgwood, who was born in Burslem England in 1730, the youngest of twelve children of Thomas and Mary Wedgwood of the Churchyard Pottery. At the age of nine he was apprenticed to his eldest brother. At the end of his apprenticeship his brother refused him a partnership and he joined John Harrison at the Cliffe Bank pottery works of Thomas Alders. After two years there, in 1754, Josiah Wedgwood was taken into partnership by Thomas Whieldon of Fenton, the greatest potter of his time. After five years, Josiah was ready to start in business on his own account, and in 1759 he founded the Wedgwood firm, renting the Ivy House Works in Burslem for ten pounds a year. At the Ivy House he introduced his first distinctive and original ware with the invention of a brilliant clear green glaze which he used to decorate leaf and vegetable shapes. In 1762 Josiah moved to the Brick House and it was there that he first produced what he described as a species of earthenware for the table. Later to be known as Queens Ware by command of Queen Charlotte, this new inexpensive, and beautiful tableware was, without question, Wedgwood’s greatest achievement and contribution to the British pottery industry. Wedgwood put fine earthenware within the reach of all but the poorest class, and his success was immediate and world-wide. In 1762, Wedgwood met Thomas Bentley, a Liverpool merchant, with whom he formed an intimate and lasting friendship, and they signed, in 1769, a partnership which ended only on Bentley’s death in 1780. By 1766, Wedgwood had prospered sufficiently to buy the Ridge House Estate. There he built himself a house and a splendid new factory which he named Etruria. It was formally opened on 13 June 1769, and six First Days vases were made by Wedgwood and his partner Bentley to commemorate the event. Until about 1764, Wedgwood had concentrated upon the manufacture of what he called useful wares, but he carried out many experiments to improve the crude Egyptian black wares already made by a number of Staffordshire potters. The new Black basalt developed by Wedgwood was fine-grained, smooth, and richer in hue, and in 1773 he forecast correctly, The Black is sterling and will last forever, as it is still one of the firms most popular products. The most famous of all Wedgwood’s inventions, however was Jasper, an un-glazed vitreous fine stoneware which could be stained blue, green, lilac, yellow, maroon, of black to provide a suitable background for white classical reliefs or portraits in the same material. Jasper was prized by Wedgwood above all his productions. Josiah’s crowning achievement in this ceramic body was the replica of the Barberini or Portland Vase. Josiah Wedgwood died on 3rd February 1795 and is remembered as the Father of English Potters.